I have so much to be Thankful for this Thanksgiving. He-Man is recovering from the knee surgery really well, and he’s allowed to put weight on the leg now. He starts physical therapy tomorrow! Big Baby Boy is on his way home for a long week-end, and Baby Girl has the day off and she too is home for the holiday along with #1 Grandson. I’m Thankful for their health, a roof over our heads, plenty of food to keep us nourished, and warm coats, but most of all I’m thankful that we’re all together, and our little family is still together, and we enjoy being together. I’m thankful for you Dear Friends for your unwavering friendship, love, support and encouragement to never give up on my dreams and goals. 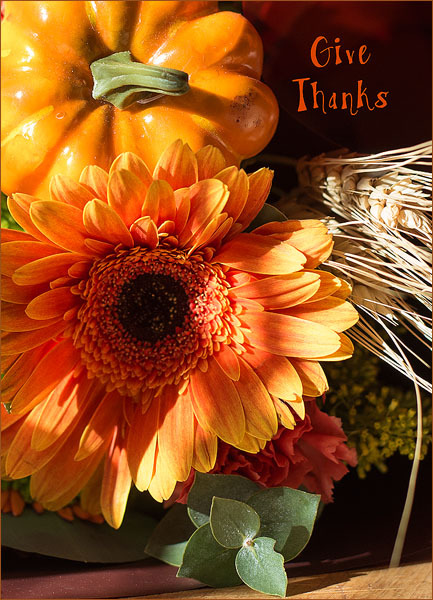 May your heart be filled with joy, and thankfulness on this Thanksgiving Day. Happy Thanksgiving to you and yours Dan!